Please contact us by email or phone, 413-773-5232, if you want to place an order. Pricing does not include shipping; shipping is extra. 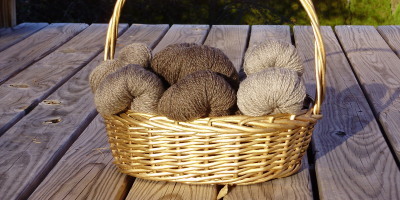 This yarn is very soft and lustrous and should make gorgeous knitted or crocheted products. Yarn is available in light gray (235 yards per 4 ounce skein), medium grey (320 yards per 4 ounce skein) and dark grey (280 yards per 4 ounce skein). Please note that the light grey is actually a little darker than it is photographed. Roving in 1 pound balls for $20. 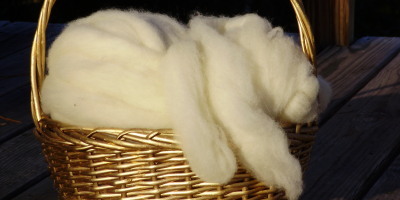 Roving is from white wool and is very soft. It should be great for spinning, dying and felting.